The Met’s exhibition of monumental abstraction places disparate works in dialogue with each other—and with the viewer. 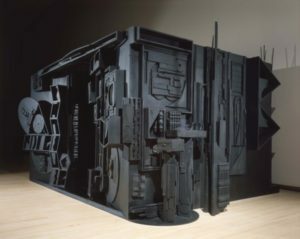 Louise Nevelson, Mrs. N’s Palace, 1964–77, painted wood, mirror, 355.6 x 607.1 x 457.2 cm. Mark Rothko, No. 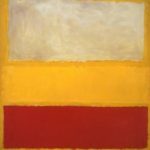 13 (White, Red on Yellow), 1958, oil and acrylic with powdered pigments on canvas, 241.9 x 206.7 x 3.5 cm. 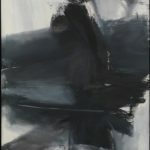 Franz Kline, Black, White, and Gray, 1959, oil on canvas, 266.7 x 198.1 cm. When Randall Griffey, a curator of modern and contemporary art at the Metropolitan Museum of Art, answered the phone, I was pleasantly surprised. On the other end of the line was a person who sounded a bit harried. His New York City commute had been a rough one, but, nonetheless I could hear the excitement in his voice when we began to discuss the museum’s upcoming exhibition, “Epic Abstraction: Pollock to Herrera,” which opens December 17 and will remain on view indefinitely. “I’ve been at the Met for five years” Griffey told me, “and much of that time has been working with the collection. 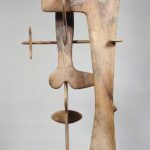 Fifty percent or more of my time is spent digging into the collection, which I love.” To hear him speak of the Met’s impressive holdings conjures an image of an academic who has traded his dusty old books for a life of adventure. Griffey is quick to mention, however, that this somewhat mythologizing explanation is by no means sancrosanct, and “Epic Abstraction” in many ways presents currents that push against it. The word “epic” almost ironically acknowledges the long-prevailing “great man” narratives of modern-art history, but in Griffey’s words, “it goes far and beyond the textbook Ab-Ex narrative, and it’s an opportunity to promote the strings of our collection.” He states in no uncertain terms that the exhibition “goes beyond the textbook canon of heroic dead, white men.” Visitors will marvel at large-scale works by Jackson Pollock and Mark Rothko while also experiencing paintings by less-known artists and global luminaries such as the Japanese painter Kazuo Shiraga, the self-taught African American artist Thornton Dial, Latin American abstractionist Carmen Herrera, and Hungarian painter Ilona Keserü Ilona. Some of the show’s most exciting moments emerge from its most disparate visions. 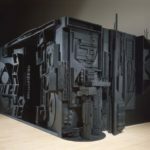 From the imposing presence of Louise Nevelson’s 1964–77 masterwork Mrs. N’s Palace (the installation’s centerpiece), which evokes the production design of Ridley Scott’s Alien reassembled as potent mindspace, to the humble power of Thornton Dial’s 2008 sculptural painting Shadows of the Field, the range and quality is both crucial and intended to impress. “This is meant to be crowd-pleasing to some extent,” admits Griffey, “because the works are simply jaw-dropping.” While the cross-cultural and cross-temporal dialogues the exhibition welcomes are far reaching and signifiant—from American Ab-Ex painter Cy Twombly to Philippines native Alfonso Ossorio to Chakaia Booker—there are also gleeful details. In the exhibition’s first room, visitors will encounter a Pollock that boasts visible footprints alongside a work by Kazuo Shiraga, an abstractionist with an interest in esoteric Buddhism who went to such lengths as to paint with his feet in order to circumvent his own conscious intent. Small, winking connections such as these are almost “Easter eggs” in an exhibition that is meant both to reignite the excitement critical to these massive works and to challenge certain calcified narratives. 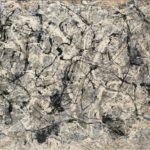 It might be difficult not to be starstruck while standing in the same room as Pollock’s iconic 1950 oil on canvas Autumn Rhythm, but this is not necessarily an unwelcome response, according to Griffey. The show embraces the familiarity and power of its best-known works while also working to offer a chance to see anew. Griffey hopes the exhibition invites visitors to hold both things in their minds at the same time as he has. In the current social and political climate, this necessary experiment seems more important for America than ever.